Our client, a prominent professional services firm in our region, recently underwent extensive renovations at their main office. 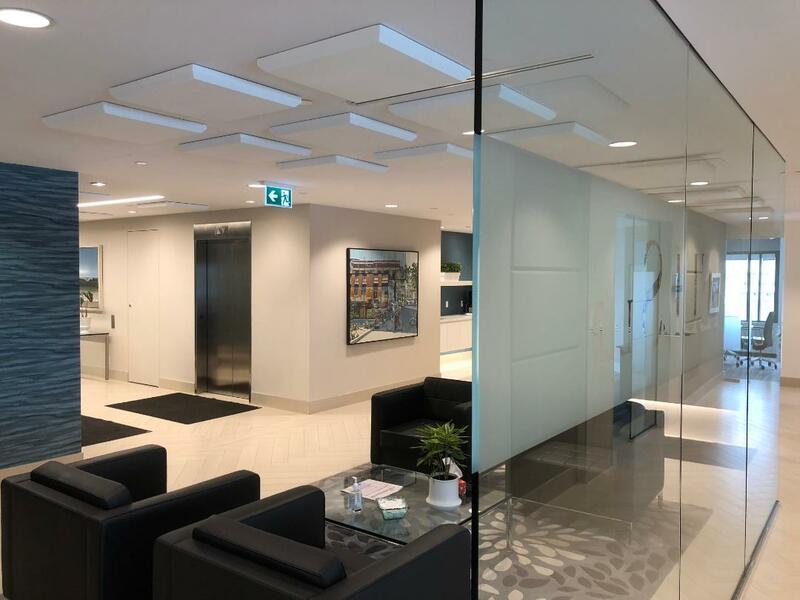 From a very aesthetically pleasing and inviting reception area to boardrooms and meeting spaces with expansive harbourfront views, the refreshed interior design, look and feel of the renovated space is modern, impressive and truly cultivates the overall professional image of the firm. While the visually appealing design elements made the new office space stand out, the use of glass and hard surfaces throughout – typical of today’s modern style offices – presented acoustical and noise control challenges in the public areas near the reception, elevators, and stairwell. Sound traveled freely creating echo and reverberation, and a noticeable distraction for those using the space. • More than two dozen 2’x4′ thick beveled sound panels mounted on the walls outside the meeting room areas, nine of which were paintable, and customized to match the décor in that area of the office. 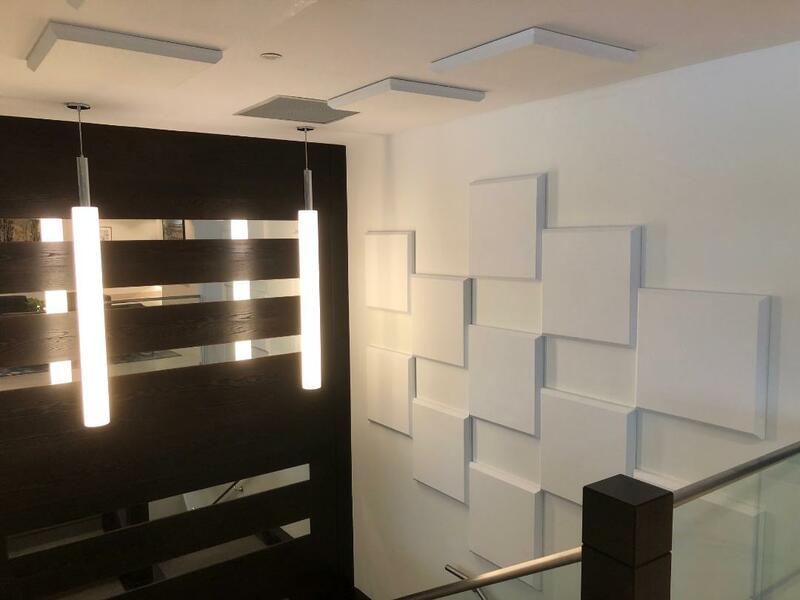 • Over four dozen 2’x4′ thick beveled sound panels, placed on the walls and ceiling throughout the lobby, elevators and stairwell area. The affected areas required a panel coverage of 15% – an acceptable level of sound absorption determined to make the overall environment acoustically comfortable. It was not an easy task to determine the location and placement of the tiles as there was a need to work around an already finished space that contained fire suppression sprinklers, lighting fixtures and HVAC vents. 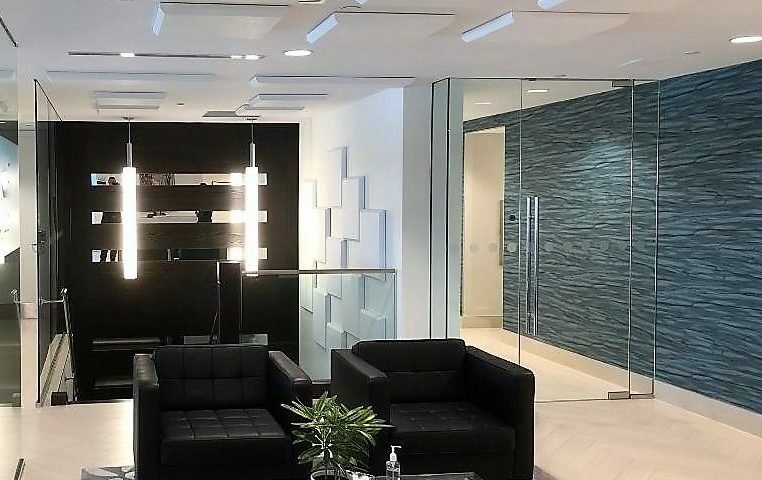 Backman Vidcom worked closely with the firm’s interior designer to determine the placement of the panels in a subtle manner that allowed for them to blend in the environment while still achieving the intended technical objectives. It was of critical importance that the project team not compromise the existing interior design and infrastructure associated with the recent renovation. THE RESULTS: Ultimately, the strategically-placed panels complemented the warm and inviting space and created an acoustically optimized office environment that decreased the echo and reverberation in affected areas by at least half. While honoring the design aesthetics of the finished space and incorporating acoustic absorption at strategic locations, the panels solved the firm’s overall acoustic issues. The partners and staff, who were actively involved throughout the process, noticed a significant improvement throughout the office. The end result was a lobby area free of noise distraction and offering a comfortable ambience where conversations can take place without any noise interruption or distraction. In addition to achieving the desired technical outcome, the placement of the sound panels incorporated into the environment seamlessly thus keeping intact the attractive design features associated with the firm’s office renovation.